Ingate's security technology dates back to 1996, and since 2001 SIP has been in focus when designing our award winning sip-aware firewall products, making Ingate the only choice for enterprises planning for a secure, flexible and interoperable communication solution. Ingate products are a perfect fit for any SIP based VoIP/UC installation. Often cited by users and media for their ease of use, over 10.000 products has been installed worldwide. A Session Border Controller is a device that connects to an existing network firewall to seamlessly enable SIP Communications (Session Initiation Protocol). While traditional firewalls block SIP traffic – including mission-critical applications like Voice over IP – the SIParator® (Ingate's Session Border Controller) resolves this problem, working in tandem with your current security solutions. The Ingate SIParator® is a powerful, flexible and cost-effective Enterprise Session Border Controllers (E-SBC) for SIP connectivity, security and interoperability, such as connecting PBXs and Unified Communications (UC) solutions to SIP trunking service providers. The Ingate Firewall®, which is always included in the product, makes the Ingate SIParator an all-in-one appliance for data security as well as the E-SBC. The SIParator simplifies SIP trunking and makes it easy to connect remote UC end points, aggregate SIP trunks and distribute sessions between sites and service delivery points. It's utilized for Real-Time communication security, SIP interoperability and extensive connectivity. The SIParator® is compatible with all existing networks and comes with a standard SIP proxy and a SIP registrar. It has support for NAT and PAT as well as for TLS and SRTP to encrypt both SIP signaling and media, eliminating the security issue most commonly associated with using enterprise VoIP. The flexible system of add-on licenses allows any enterprise to enhance the SIParator®/Firewall® solution to meet the needs at any given moment. After more than 10.000 installations worldwide, the Ingate SIParator® come in a wide range of capacity, and have been used by retail companies, financial institutions, industrial firms, government agencies, call centers and small-to-large enterprises worldwide. The SIParator®/Firewall® is available as hardware, and also as a software deliverable for virtual machines (VM) or the cloud (Amazon Web Services, Microsoft Azure, OpenStack, Google Cloud Platform). Ingate's Software SIParator®/Firewall®, which offers the same security and SIP-enabling functionality found in Ingate's hardware-based E-SBCs is designed to be installed on a virtual machine using one of several hypervisors. It is intended for IP-PBX vendors, system integrators and customers deploying a large number of Ingate products on their own hardware platform. Businesses connecting their infrastructure to a SIP Trunk, or VoIP Connection, require a Session Border Controllers (SBC) for security, interoperability and transcoding. An SBC will automatically do the call translations, with the built-in interoperability features and also translate the audio with built-in transcoding capabilities. Watch the TMC interview where Ingate's Steve Johnson discusses Ingate's Session Border Controllers and their cloud realization on Amazon Web Services, Microsoft Azure, OpenStack and Google Cloud Platform. 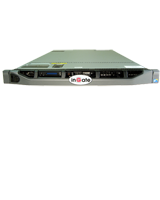 The SIParator®/Firewall® is a device that connects to an existing firewall to seamlessly allow the traversal of SIP-based communications. It is cost effective and compatible with all existing firewalls and operating systems. It prevents unauthorized access to and from enterprise networks. All messages entering and leaving the network are routed through the SIParator®/Firewall®, which examines each packet and blocks those not explicitly authorized to pass. The S21 is a powerful tool that offers small businesses, branch offices and home workers complete support for IP communications based on SIP. With the SIParator 21, these businesses can leverage the same productivity and cost-savings benefits of Voice over IP and other IP-based communications as large corporations. It manages up to 400 concurrent RTP sessions. The Ingate SIParator®/Firewall® S52 is a powerful tool for businesses wanting to step up to the next level of using Voice over IP and other IP-based realtime communications, and to do so not only within the company, but outside the enterprise as well. It manages up to 2000 concurrent RTP sessions. 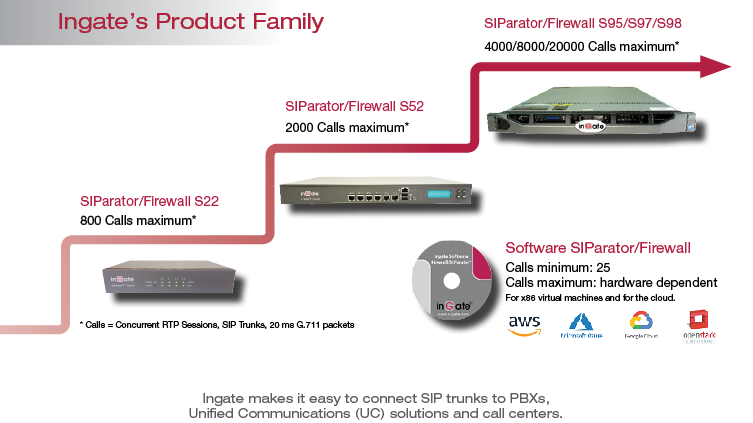 The Ingate SIParator®/Firewall® S95/S97/S98 are E-SBCs that offers large enterprises a controlled and secured migration to Voice over IP and other live communications, based on SIP. With the Ingate SIParator, E-SBC even the largest of businesses, with branch offices around the world and remote workers, can easily harness the productivity and cost-saving benefits of VoIP and other IP-based communications while maintaining current investments in security technology. The Ingate SIParator® 95/97/98 are high capacity, high performance E-SBCs designed for large enterprises, call centers and service providers, and can handle up to 20,000 RTP sessions. Ingate's Software SIParator®/Firewall® is the software version of Ingate's E-SBCs, - the solution for enterprises that want to deploy Ingate products on their own hardware platforms. The Software SIParator®/Firewall® is designed to be installed on a virtual machine using one of several hypervisors. Maximum RTP session capacity depends on hardware. Ingate's included features and the flexible licensing system give any enterprise the flexibility to create the SIParator®/Firewall® that solves their specific need for the moment. All licenses can be added at any time.